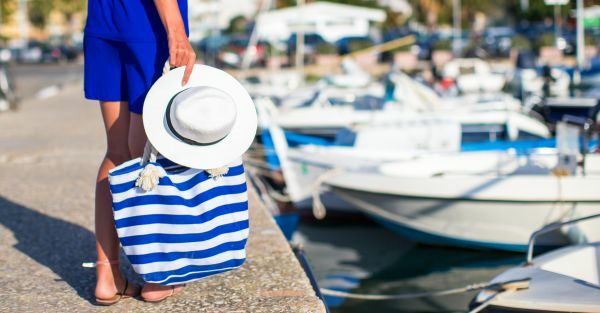 15 Cute Travel Bags You Need Before Your Next Weekend Getaway! If you’re off on a romantic monsoon getaway or just a quick overnight meeting in the big city – a stylish travel bag can make all the difference. Keeping in mind that it has to hold your entire world (clothes, beauty products, shoes and that trusty hair iron), we’ve put together a list of our favourite travel bags for every personality. If you’re skipping along the coast, then nothing screams beach chic than a stripe duffle bag that can also double up as a beach bag. It’s easy to clean and spacious enough for the necessities. Heading to the weekend house for a night? Then this monochrome bag from Nine West is ideal. Lots of compartments and made with a combination of fabric and leather, this one will be stylish pick. For the free spirited girl who is always jet-setting off to Gokarna or Hampi, this bag will speak to your soul! It’s made with a canvas material that will take all those long hikes and nights under the stars. We love this one from The House of Tara. Along with your stroller, a bold and classic oversized tote is an essential for any seasoned traveller. This colour-blocked one by The Label Life, can carry all your documents, makeup and travel kits, while keeping you looking ultra-chic. For the jeans-and-tee girls out there, who have a little country flair, this check-pattern bag is perfect for your wardrobe. Casual and utilitarian, this bag is great for a quick weekend getaway with the BFF. Maybe you’re not off to Paris just yet but you and your beau can both use this vintage inspired bag. We love the typography and leather handles that are a little masculine yet still very feminine and vintage. Girls who love adventure sports and letting the world unfold, need a travel bag that is just as superb as they are. This durable and trendy bag by The North Face can be worn as a backpack or carried as a regular duffle bag. Also, it comes with many compartments - so it’s great for life spent amongst the mountains. Escape the city and head as far away as you can – with this bag you can literally ‘escape’. It’s a great size for an overnight bag or a weekend getaway. It’s also made from faux leather and canvas which makes it cruelty-free and great for vegans! Backpacks made a huge come back two years ago and why not, they are convenient to use, come in various shapes, sizes, patterns and are SUPER CUTE! This one by Origami Lily is fabulous with the little icons and emojis – what’s not to love! If you’re into the minimalist style or just love metallics, this pink duffle bag is a great addition to any vacation! It’s really spacious for all your little products and shoes. When you’re not travelling, you can use it as a gym bag to add some spark to your workouts! A trip to Bali or Boracay is incomplete without this hand-woven bag by Twinology. The mustard yellow and white pattern will look stunning on the beach and compliment all those breezy beach dresses! There is nothing quite like travelling with a trunk and having it as a part of your luggage set. It’s a piece that you can pass on through generations. This one by Nappa Dori in baby blue with tan leather accents is just delightful and perfect for any adventure. The ultimate travel bag is one that you don’t have to carry! This lightweight, hard-bodied trolley bag is an essential for any girl who loves to travel. Plus, the bright turquoise colour makes it immediately identifiable on the conveyor belt at baggage claim. No matter your travel bag, you have to protect your high heels and these cute little bags will do just that on your travels. They come in a set of 3, which is great unless you can’t decide on how many to take! For all the girly girls out there, our list wouldn’t be complete without a bit of floral print, would it?! This bag is the perfect size for a couple of outfits and some bikinis! Don’t forget the sunscreen if you’re heading to the pool.